It is 104 degrees in the shade here in Dallas but I thought it was perfect timing to talk about quilting with Snuggles. 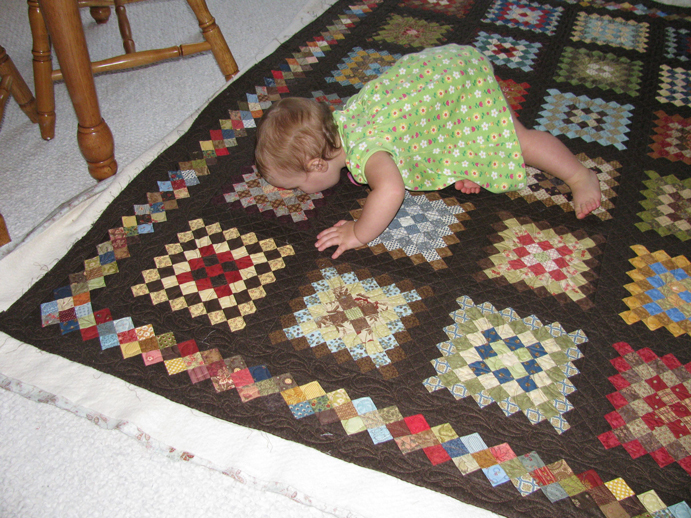 We use Snuggles as backing for everything from baby quilts, dorm beds to rugged men’s quilts. Fabrics like this can be a little more difficult to handle than the 100% cottons quilters are accustomed to so I asked Maggi Honeyman about quilting with it. She has shared some of her tips with us for long-arm quilting. 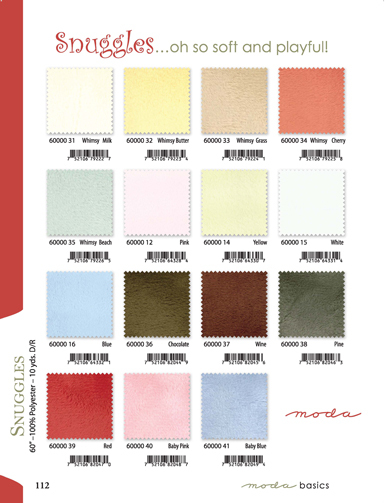 Moda’s Snuggles fabric line is an absolutely wonderful treat to use as a backing. While it may look a little daunting, long arm quilting on Snuggles is really not a problem as long as you follow a couple of easy tips. Here are a few ideas to share with your customers. Next – the fabric must be loaded on the crossgrain of the fabric – the stretchy cut side – and not on the selvages. The selvages would certainly be easier to pin but take it from experience, it doesn’t really work out so well! Also, it’s important to put the pins very close together so as not to stretch the fabric. Now that you have the quilt loaded be sure not to put too much tension between the top and bottom rollers – again, you do not want to stretch the fabric. After basting, clamp carefully and then quilt away. I would always recommend using a new needle and if you’re going to use a batting, use a fairly thin one as the fabric itself is heavier than a regular quilting cotton. The quilting shows up so wonderfully on the back because the thread buries itself in the pile and leaves a fabulous dimension. The little extra effort it takes to use Snuggles is so worth it as this fabric is the softest, most snugly stuff you have ever touched. Maggi Honeyman – Sew, Maggi’s Quilting! Do you want to know more about Maggi? How did you become a quilter? What I mean by that is how long have you been piecing quilts for your personal use? When did you start machine quilting for the public? How did that all come about? I started machine quilting 11 years ago as a result of total day care burnout! My youngest was 11 and I couldn’t wipe another snotty nose or “you-know-what”. But, I had 3 children under the age of 18 still at home and decided I needed to be home worse then than when they were babies and machine quilting gave me that option. I’ve heard that you bought your house to fit your quilting machine? Tell me about that. time to turn the “Lincoln in the living room” off. Favorite quilt? I know this is like asking if you have a favorite child. Favorite?? I think each quilt is it’s owners favorite even if every once in a while I will get a quilt that is pretty badly pieced. They are much more difficult to work on. These quilts used to cause me a lot of stress but I have come to the comfort of knowing that the person who made it did it with love and as well as she could and she enjoyed herself while she was making it. Much less stress on my part that way! Favorite??? I have had many over the years. Cop out answer, I know, but usually it is just about living in the moment. I have had so many wonderful customers and the opportunity to quilt many beautiful quilts. If quilting is your business, what is your hobby? my business (which isn’t anytime soon!). How do you pick the quilting designs? Threads? I try and let the quilt “talk” to me. Sometimes they are stubborn that way though! But really, I look at the style of quilt and fabric and let that be the place to start. I have collected lots of books and magazines over the years that I refer to and the Internet is a great place to look for quilting ideas. Of course sometimes the quilt maker has specific ideas and I always try and give that customer what she wants. Thank you Maggi for sharing your tips on Quilting with Snuggles. Ask for these at your favorite Moda Retailer. How wide is snuggles, can it be pieced, and could it be used on a juki mid arm at home? 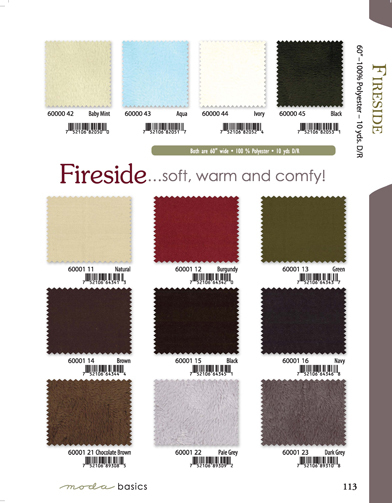 What is the fabric content and what type of thread is recommended? The fabric is 100% polyester (not your grandmothers polyester :0), it is 60″ wide and can be pieced. There should be absolutely no problems using your Juki mid arm machine to quilt, just follow my hints about loading it on the machine. And as far as thread goes, my machine, Gammill Classic, is kind if picky and only likes Signature 100% cotton. Any thread should be fine though. Have fun with it, the fabric is so awesome. Thank you Sewmaggi! I have been dying to try it but very scared. I’ve tried minky before on small projects and while it feels great it wasn’t fun to sew with. Next time I do something for my kids I’ll have to do Snuggles. Great to hear from you Maggi! Love your quilting!